A Professional Field Service Technician will take responsibility for providing the desired customer service typically in the outdoor. 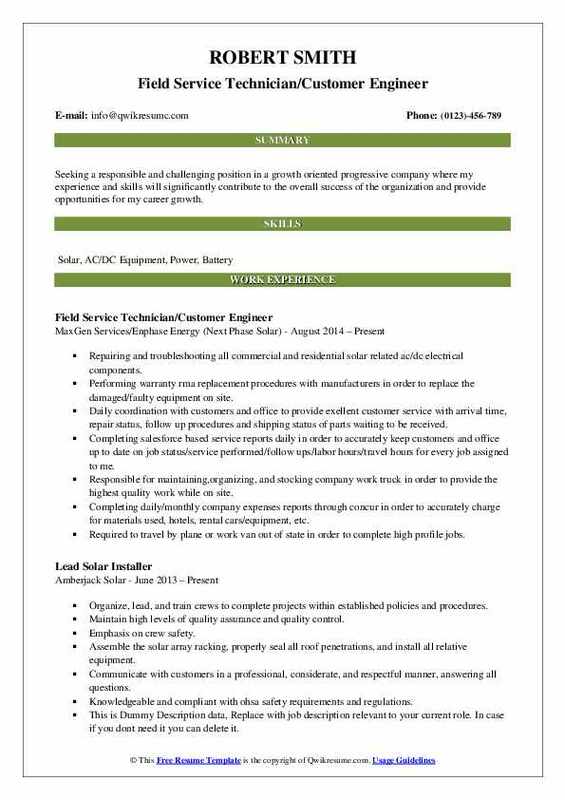 The duties and tasks that are carried out and listed on the Field Service Technician Resume are – providing service and customer support during field visits, tying workflow to schedule, managing site installation and repair tasks, diagnosing errors and technical problems, documenting processes, producing timely detailed reports, training new staff, following company’s procedures and protocols, cooperating with technical team, and building positive relationship with customers. 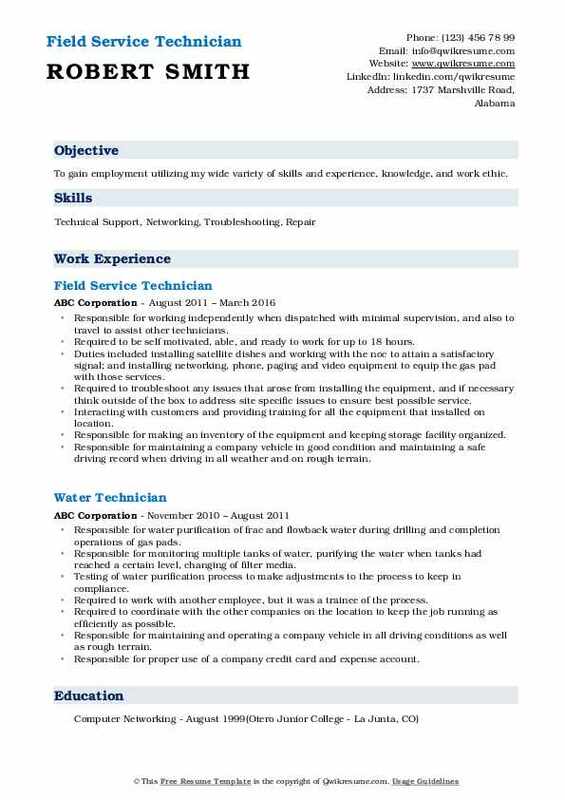 The ideal candidate must be able to demonstrate on the resume core assets such as – proven fieldwork experience, ability to troubleshoot, repair and test technical equipment; English literacy, familiarity with mobile tools and applications, and customer focusing skills. As far as formal education is concerned, employers don’t expect anything more than a technical degree or certificate. 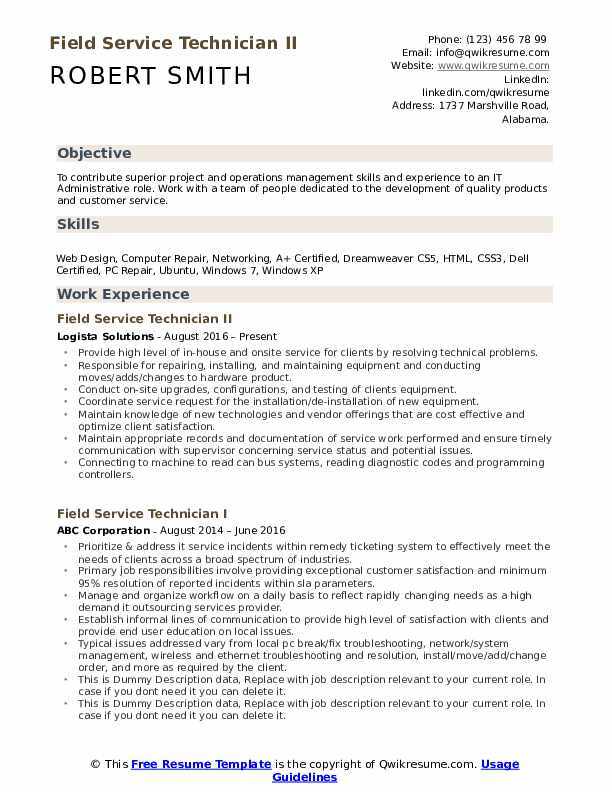 Summary : Talented, hardworking professional with superior computer, networking, and electronic skills looking for a long term, full time position with a strong company offering an opportunity for advancement and growth based on experience and job performance. Performs autonomous operations in support of dsts at field locations throughout the world. Schedules preventative/corrective maintenance manages spare parts and spare part inventories assesses rma needs coordinates with government daily on equipment status updates and maintains inventory and control of gfp/gfe, tools, spares and test equipment. Capable of filling in for the dsts operator if and when the need arises. Perform preventive maintenance of all equipment per a pre-defined maintenance schedule battery management to include removal and installation before/after an exercise and the re-charging of batteries as directed by the battery management plan to ensure the maximum re-use of the batteries. Trouble-shooting and replacement of defective equipment using applicable standard tools and equipment. Acceptance of new/replacement equipment including unpacking and installation. Perform system administrator (sa) duties to support dsts site operations to include: ensuring the software and computers are operating properly. Ensuring the correct software is downloaded to each computer making sure that log files are cleared to ensure allocations are not exceeded troubleshooting and reporting software problems developing scripts to make operations more efficient. Maintain on-site automated logs for pre-operational checkout, preventative and corrective maintenance actions, inventory control, and system usage rate data. Objective : Seeking a responsible and challenging position in a growth oriented progressive company where my experience and skills will significantly contribute to the overall success of the organization and provide opportunities for my career growth. Repairing and troubleshooting all commercial and residential solar related ac/dc electrical components. Performing warranty rma replacement procedures with manufacturers in order to replace the damaged/faulty equipment on site. Daily coordination with customers and office to provide exellent customer service with arrival time, repair status, follow up procedures and shipping status of parts waiting to be received. Completing salesforce based service reports daily in order to accurately keep customers and office up to date on job status/service performed/follow ups/labor hours/travel hours for every job assigned to me. Responsible for maintaining,organizing, and stocking company work truck in order to provide the highest quality work while on site. Completing daily/monthly company expenses reports through concur in order to accurately charge for materials used, hotels, rental cars/equipment, etc. Required to travel by plane or work van out of state in order to complete high profile jobs. Efficient in operating heavy equipment such as boom lifts and scissor lifts. Excellent written and verbal communication skills attend training workshops and team meetings to maximize technical knowledge. Headline : Highly motivated and extensively trained in painting and general repair and maintenance. Reliable and punctual with a strong background in the Agriculture, Construction, and Service industry. Always willing to learn any new machinery and easily trained. Skills : Proficient With Mig Welder, Oxy Acetylene Torch And Plasma Cutter Fabrication Experience Professional Painter Forklift Certified At CHS-Primeland. Outstanding ability to multi-task in a fast paced environment while under pressure, able to meet deadlines and assigned projects and daily tasks. Excellent organization skills and detail oriented with proven ability to organize and prioritize a large variety of work to meet multiple deadlines. Assisted with special projects pertaining to training of new employees. Read work orders and set application rates and maintain rate during an entire application process. Kept different variety separate and accounted for all products with weight tickets and bill of lading. Fill and delivered chemical orders from work orders using forklift and heavy truck. Maintained truck fleet and equipment including small engine pump and application equipment. General fabrication and use of welding and cutting equipment consisting of mig and stick welder, oxy acetylene torch and plasma cutter. Operated custom fertilizing and responsible for getting to the correct field using maps, setting rates while determining amounts needed without large overages. Objective : Customer-oriented Field Foreman focused on increasing production, minimizing equipment downtime and costs and maximizing overall company efficiency. 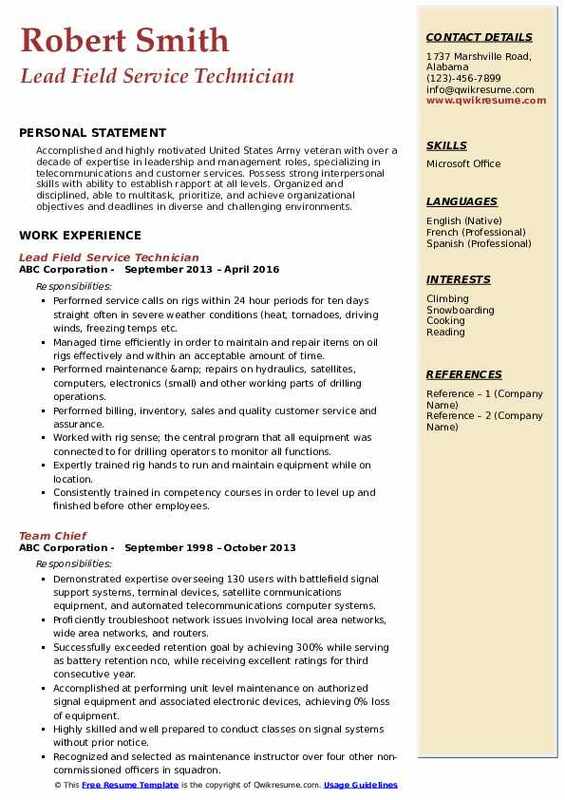 Pursuing a place of employment to gain experience where I will be able to apply my life experiences as well as my interpersonal skills, to not only allow myself to grow personally and professionally, but to firmly contribute towards the achievement of the mission and values of your company. Coordinated delivery and setup of frac tanks, acid tanks and gas busters. Operated heavy material handling equipment such as forklifts, man lifts, and overhead cranes. Inspected truck equipment and inventory daily and reported safety hazards. Operated bobtail vac-trucks to clean and contain fluid spills and overflow. Responsible for providing 24 hour on-call technical support of field installations and employee incidents/emergencies. Headline : To gain employment utilizing my wide variety of skills and experience, knowledge, and work ethic. Responsible for working independently when dispatched with minimal supervision, and also to travel to assist other technicians. 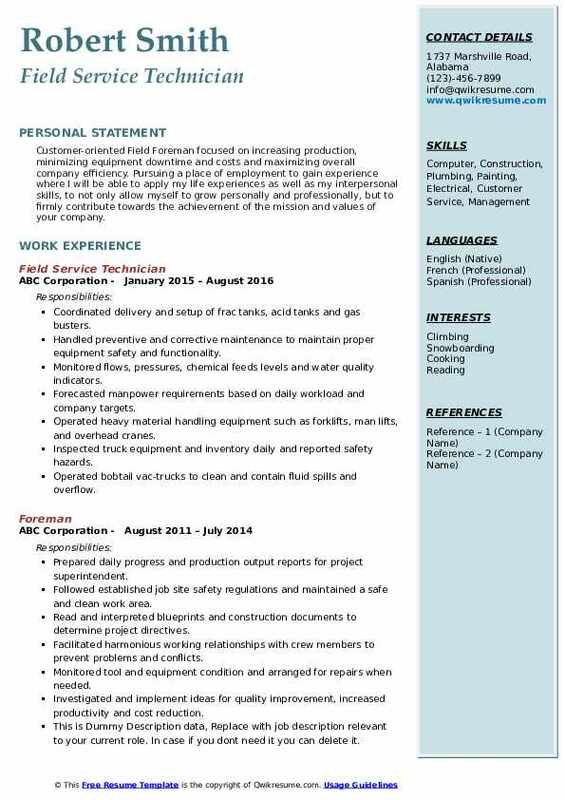 Required to be self motivated, able, and ready to work for up to 18 hours. Duties included installing satellite dishes and working with the noc to attain a satisfactory signal; and installing networking, phone, paging and video equipment to equip the gas pad with those services. Required to troubleshoot any issues that arose from installing the equipment, and if necessary think outside of the box to address site specific issues to ensure best possible service. Interacting with customers and providing training for all the equipment that installed on location. Responsible for making an inventory of the equipment and keeping storage facility organized. Responsible for maintaining a company vehicle in good condition and maintaining a safe driving record when driving in all weather and on rough terrain. Responsible for proper use of a company credit card and expense account and making necessary purchases to complete jobs. Summary : Provide quality innovative electrical maintenance, repair, inspection and leadership in a fast paced organization with a focus on customer satisfaction, quality and growth. Perform system start-ups, commissioning, preventative maintenance, and repair to state of the art programmable dimming and switched lighting systems. As a certified and trained lutron service technician, my work experience includes quantum, grafikeye systems, grafikqs, energy saver node and ecosystem, lcp / xps, homeworks, and radiora2. 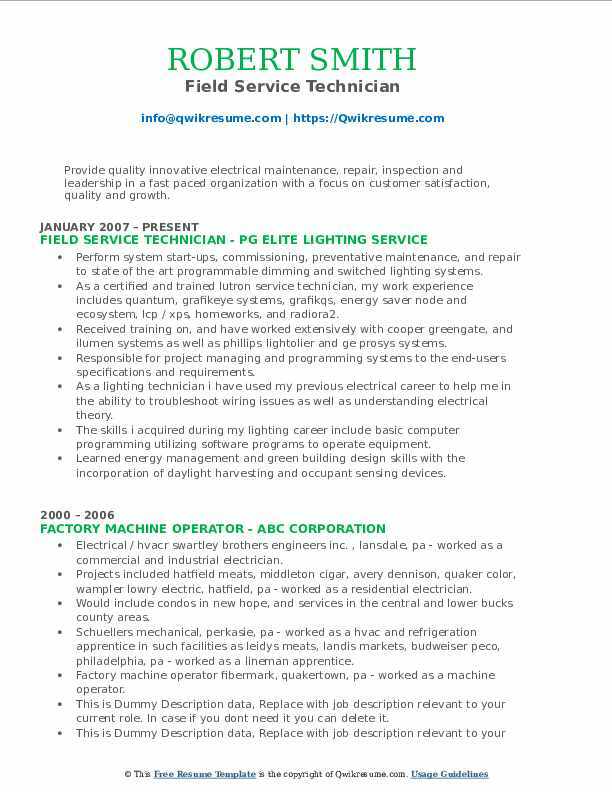 Received training on, and have worked extensively with cooper greengate, and ilumen systems as well as phillips lightolier and ge prosys systems. Responsible for project managing and programming systems to the end-users specifications and requirements. As a lighting technician i have used my previous electrical career to help me in the ability to troubleshoot wiring issues as well as understanding electrical theory. The skills i acquired during my lighting career include basic computer programming utilizing software programs to operate equipment. Learned energy management and green building design skills with the incorporation of daylight harvesting and occupant sensing devices. Design, install, program, and maintain a lighting solution that will save energy as installed. 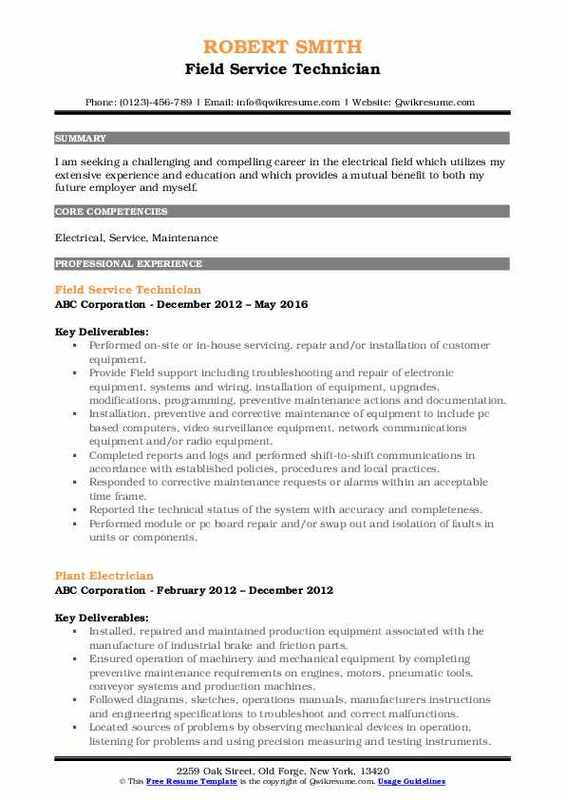 Objective : I am seeking a challenging and compelling career in the electrical field which utilizes my extensive experience and education and which provides a mutual benefit to both my future employer and myself. Performed on-site or in-house servicing, repair and/or installation of customer equipment. Provide Field support including troubleshooting and repair of electronic equipment, systems and wiring, installation of equipment, upgrades, modifications, programming, preventive maintenance actions and documentation. Installation, preventive and corrective maintenance of equipment to include pc based computers, video surveillance equipment, network communications equipment and/or radio equipment. Completed reports and logs and performed shift-to-shift communications in accordance with established policies, procedures and local practices. Responded to corrective maintenance requests or alarms within an acceptable time frame. Reported the technical status of the system with accuracy and completeness. Performed module or pc board repair and/or swap out and isolation of faults in units or components. 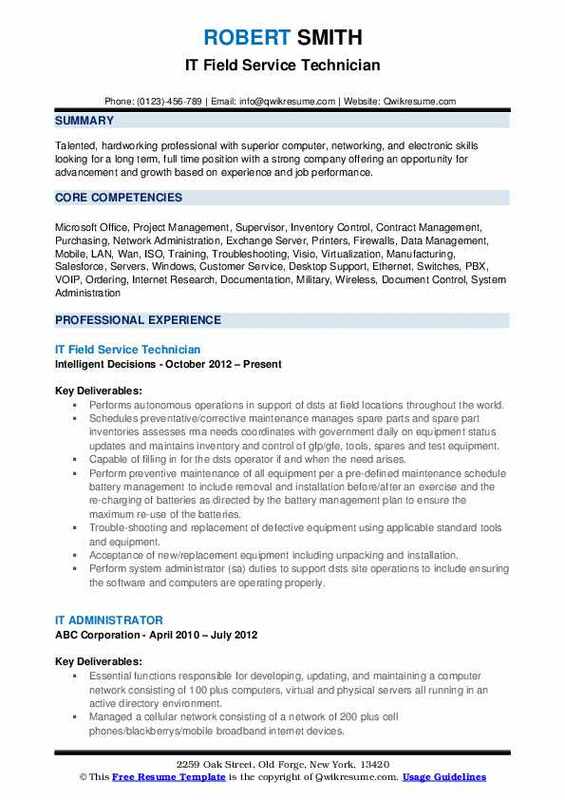 Summary : Accomplished and highly motivated United States Army veteran with over a decade of expertise in leadership and management roles, specializing in telecommunications and customer services. Possess strong interpersonal skills with ability to establish rapport at all levels. Organized and disciplined, able to multitask, prioritize, and achieve organizational objectives and deadlines in diverse and challenging environments. Performed service calls on rigs within 24 hour periods for ten days straight often in severe weather conditions (heat, tornadoes, driving winds, freezing temps etc. Managed time efficiently in order to maintain and repair items on oil rigs effectively and within an acceptable amount of time. Performed maintenance & repairs on hydraulics, satellites, computers, electronics (small) and other working parts of drilling operations. Performed billing, inventory, sales and quality customer service and assurance. Worked with rig sense; the central program that all equipment was connected to for drilling operators to monitor all functions. Expertly trained rig hands to run and maintain equipment while on location. Consistently trained in competency courses in order to level up and finished before other employees. Maintained a positive attitude despite long hours and sometimes frustrating situations. Objective : To contribute superior project and operations management skills and experience to an IT Administrative role. Work with a team of people dedicated to the development of quality products and customer service. Provide high level of in-house and onsite service for clients by resolving technical problems. 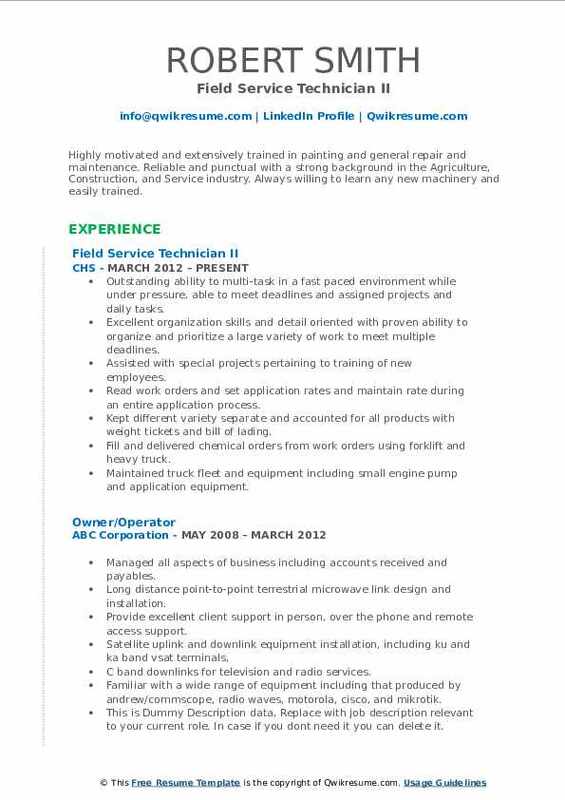 Responsible for repairing, installing, and maintaining equipment and conducting moves/adds/changes to hardware product. Conduct on-site upgrades, configurations, and testing of client's equipment. Coordinate service request for the installation/de-installation of new equipment. Maintain knowledge of new technologies and vendor offerings that are cost effective and optimize client satisfaction. Maintain appropriate records and documentation of service work performed and ensure timely communication with supervisor concerning service status and potential issues. Connecting to machine to read can bus systems, reading diagnostic codes and programming controllers. Determines most cost effective repair/resolution to minimize customer downtime and shares knowledge with their team members.